End Boards (End Fitments) | Anderson Forest Products, Inc. Imagine a roll of kitchen plastic wrap. Now instead of one you can fit in your hand, imagine a roll of plastic as big as a desk. End boards, also called end fitments, are large squares attached to both sides of these rolls to suspend them and keep them from rolling around in a trailer during transport. A few consumers of end boards, include the Plastic Flexible Packaging industry and the Polyester Film industry. End boards are crucial to the storage and transportation process for these industries. End fitments are cut out of various materials depending on the customer’s need. 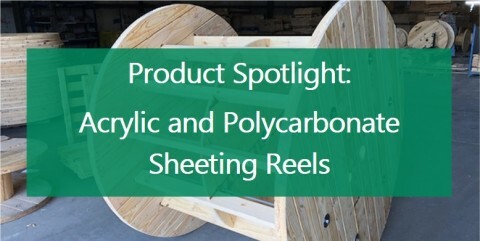 These materials include Southern Yellow Pine plywood, Russian Birch plywood, MDF, and particle board. Our most common thicknesses range from 8mm to 24mm. We cut end boards using CNC Routers for high-speed precision cutting. We currently own and operate five CNC Routers, two of which are top-of-the-line Shodas. Below is a video of the Northwood in action. The Shodas are capable of cutting material at up to five times the speed of the Northwood. The only limit to the size of end boards we can produce is the size of the material. 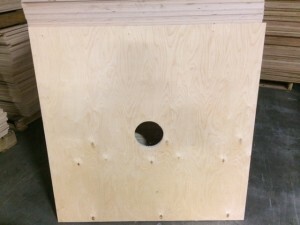 We can produce end fitments in any shape and any size that isn’t larger than a sheet of plywood. If your needs exceed this, we can look into creating a custom solution. 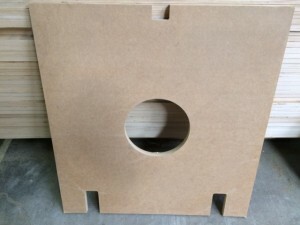 We currently produce end boards from 14”x14” to 44”x44”.